We provide Confidential Paper Shredding in Dublin. This service covers our clients located in the greater Region. Our confidential services include Document Shredding, Product, Hard-Drive, Optical & Magnetic Media, and Confidential Waste Disposal. Our level of security and professionalism provided with all of our service deliveries has been a key contributor to Company’s success to date. Our high security paper shredding dublin services provide all of our clients with full traceability of their confidential paper waste in the form of Certificates of Destruction and Certificates of Recycling. The certification from our on site service in this region is fully auditable. We are fully automated which results in the client’s confidential paper waste not being visual to our professional staff nor touched during the process. The full shred process can be viewed by the client via our on-board VDU screen that videos the process as the confidential documents are being destroyed. This again increases the level of security and confidentiality of our onsite service delivered to our clients. In addition to our on site confidential document shredding service our clients can avail of our innovative off site paper shredding service. 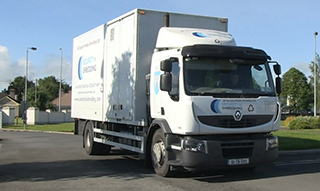 Our off site service in Dublin involves our high security document collection vehicles and fully trained staff arriving at the client’s premises to securely collect the client’s confidential documents. Once collected all confidential paper enters our confidential process at our secure facility. We have a “Same Day Shred” policy which in turn guarantees our client’s confidential data will be destructed the same day as collection. Our unique policy increases the level of security within our off site option. With our offsite work, we provide all of our clients with Certificates of Destruction and Recycling which in turn provides the client with a full guarantee and verifies that their confidential paper is removed appropriately. Our On site Paper Shredding Dublin in addition to our Off site services cater for clients that require once off clear out services. Many clients with paper waste production require annual clear outs in order to clear space, move office and clear end of year documentation that has been stored for the required retention period. Our confidential paper shredding clear out service is available to clients with both large and small quantities of documents. We provide our clients with expert knowledge and advice in relation to confidential paper management which in turn will eliminate potential risks in relation to data protection legislation. 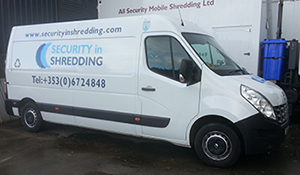 Document shredding is available in Dublin and surrounding areas. Not sorting our this issue can cause a great deal of stress for Organisations today. With stringent legislation for Data Protection in addition to further data protection legislation coming from Europe it is essential for organisations in this area to hire companies that satisfy their legislative requirements in addition to minimising risk of negligence when hiring a reputiable company. There are many vendors that may not satisfy an audit situation for a client and it is for this reason that clients can be at serious risk of negligence when destroying data through these services. All vendors are required to have the relevant document shredding certifications. These certifications are not simply “certifications of destruction” provided to a client as there are European Certifications and National Bodies that vendors are required to have and be members of in order to be identified as a professional vendor at a European Level. Whether you require an onsite paper shredding service or an offsite paper shredding service, our dedicated customer care staff will be there to guide you with every step of the way. In addition to the paper services, our dedicated customer care team can arrange our certified hard-drive shredding service to meet your requirements and achieve compliance with the Data Protection Law for you and your business. Please do not hesitate to call our client care team for assistance.